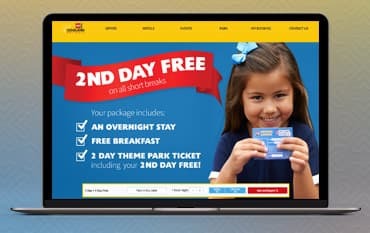 Where do I use my Legoland Holidays voucher code? In addition to Legoland’s own 55 rides and attractions - plus their own fantastic events and shows including seasonal specialities on Halloween and Fireworks night, the shows at the Imagination Theatre and Duplo Theatre, and the breathtaking displays of the Pirates of Skeleton Bay Stunt Show - you can also add in other local attractions like Chessington World of Adventures and Sea Life London Aquarium. The Legoland themed hotel is packed with Lego-themed fun and rooms styled after the popular Pirate, Kingdom and Adventure Lego playsets. There’s something for everyone in Legoland - from the amazing Miniland scale models of famous cities and the Creation Centre for budding brick artists, to Duplo Land for younger kids and even the incredible The Dragon rollercoaster nestled deep within the Knight’s Kingdom. LEGOLAND® Windsor Resort is the perfect place to stay for your LEGOLAND break. You'll' enjoy so much LEGO® fun and entertainment for all the family that your stay will be a like a holiday in itself! You'll find a free LEGO gift hidden in your room, have a fabulous time in the LEGO pirate-themed indoor water play area and pool, and enjoy a tasty meal in BRICKS Family Restaurant or the Skyline Bar, where even the chips are LEGO shaped! The Legoland Windsor hotel will help make your break extra special and fun for all, as your kids favourite LEGO characters and playsets are brought to life. You'll find some great offers on the Legoland website such as "Kids Go Free", which allows all the family to enjoy a fun-filled break for a fabulous value for money price. They also often offer free days, which means that if you book a break with 1 day's park entry, you will get the 2nd day completely free! Every break includes an overnight stay, use of the hotel facilities, and a delicious breakfast in the morning. You can opt to stay in a themed room at the LEGOLAND Resort Hotel, the brand new LEGOLAND Castle Hotel, or in one of their partner hotels near to LEGOLAND. The free day offer also applies to longer breaks, so you could have 2 for 1, 3 for 2 or 4 days for 3! If you check the Legoland website you'll see that there are lots of exciting events planned. There are special weeks like the Junior Builder week and Splash and Stay breaks. Lots of events are organised during school holidays and at Christmas, the kids will get really excited about Santa Sleepovers and Christmas Bricktaculars, New Teares Eve brings lots of family fun too with spectacular fireworks and great entertainment. Check out the events on offer and book a fun-filled family break today. At Legoland, they understand that sometimes you may need to make changes to your booking. If this is the case, you will need to notify the company as soon as possible in order for them to assist you in your requests. be aware that some amendments may incur additional charges. All changes must be made through Legoland Holidays Customer Service team and must be made no later than 36 hours before the date of your ticket entrance. If any later, these will be treated as a cancellation in which you will have to pay charges. See customer service details below. Your first day on the Theme park can be any day you choose to visit during your stay. However, any extra days planned for example if you got your 2nd day Free, you must use this on consecutive days. For example, if the first day you visit is on a Friday, you must use your free 2nd day on Saturday. Find more FAQ's and Answers here. Legoland Holidays are the official short break provider for Legoland Windsor, so you can enjoy an extra long visit to one of the most exciting and imaginative places in the world! A Legoland Holidays package deal combines tickets to a wonderful paradise of rides, attractions and adventure with accommodation in local great value 3 and 4-star hotels nearby, including the Hilton and the Crowne Plaza, as well as the spectacularly theme Legoland Resort Hotel. The added bonus of a Voucher Code courtesy of us could help save you fortunes on your next booking so ensure your browse our deals section before checking out. Treat your kids to a break-away they will cherish for life and create fun-filled memories that you can treasure for a lifetime with Legoland Holidays. We are constantly on the hunt for Voucher Codes for Legoland Holidays to help you with your money saving. Our experts check dozens of sites for secret codes including NHS discounts, student sites & social media channels saving you time & money!